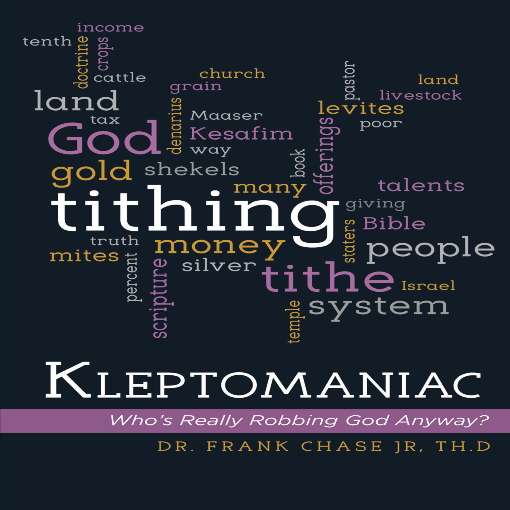 KLEPTOMANIAC is a journey into the annuals of biblical history concerning what the Bible teaches about tithing and giving. This book will take you on the proverbial archeological quest to uncover the true meaning of biblical words that deal with money. When confusion exists about what certain words mean in the Bible, such as tithe, tithing, tenth or ten percent, this book will examine the Hebrew and Greek language to bring to life what these words actually mean in context. This book will upend the common beliefs held by believers concerning giving and tithing based on the history of the original people of the Bible and how they related to money. From the very beginning to the end of the book, everything is supported by Scripture and research. You will know from the onset why the author, Dr. Frank Chase Jr., wrote the book and learn about his personal story of what happened as a result of embracing New Covenant giving principles from the New Testament.